It’s 2018, and sustainability in all things we consume is no longer just an ‘option’, but a necessity. Whether it’s food, clothing, or accessories; here are 5 Pune-based brands that showcase sustainable products. India Imprints is a concept store, started by Aparna Phadke earlier this year. In addition to stocking their own ethnic-wear label (Indo Mood) as well as a couple of other brands, they also collaborate with artisans from across the country to create one-of-a-kind pieces that you really wouldn’t find elsewhere. They’re all about giving back and empowering traditional craftsmen (and women), and we think that their products (clothing, accessories, and beauty products) are worth the buy. Started by Hitesh Parwani and Dinesh Relwani, Tribe offers a range of authentic wooden, and combination (semi-wooden) sunglasses, watches, and other accessories (in-the-making). Made from a wide variety of hardwood, softwood, and re-purposed particle fibre wood; Tribe’s products are both eco-friendly, and sustainable. One of our favourite new finds, Ek Dori is a homegrown fashion label started by Abhilasha Mehta. 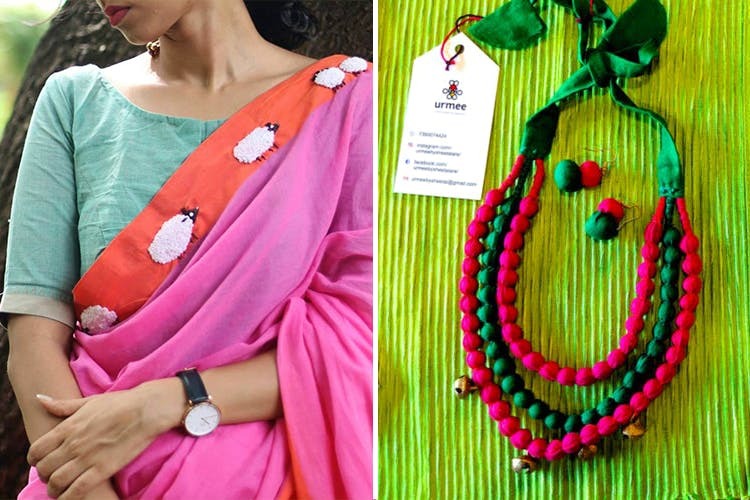 From linen hand-embroidered saris to up-cycled dresses and hair accessories – Ek Dori aims to be as zero-waste as possible, and will often re-purpose scraps of clothing into fashionable statement pieces. Each piece is one-of-a-kind in its own right, and almost every item of clothing has vintage materials incorporated into it. Happy Roots is a National award-winning social enterprise started by Reema Sathe in 2015, that partners with small-holding farmers at the grass-roots level to produce fair-trade handcrafted natural snack food products. Every purchase of their products puts money back into developing the skills of these farmers and women – which we think is a cause worth supporting. Outliers Clothing Co. is an upcoming sustainable and ethical organic clothing company, founded by Rohit Oswal and Tejas Shah. A homegrown Pune label, their t-shirts are made from 100% non-GMO certified organic cotton – dyed without the use of bleach or chemicals. Available in solid, polo, slubs (in slub material, the threads are thicker in places – giving it more texture), graphics printed and pocket-style, these minimalist tees can be worn as-is, layered to build a ‘look’. We love that they’re eco-friendly, and also super-soft on the skin. Ideal for Indian summers, they’re priced between INR 700 – 1300, and you can shop via their Facebook page here. The CoCo Market by The Wagabond Chefs is your one-stop-shop for all things organic and sustainable. From bamboo toothbrushes to organic mangoes, hand-made bath soaps, and more – we found multiple stalls here that fit the bill.